Traditional meters for electricity, gas and water are mechanical in nature and have dials that slowly turn to indicate how much has been consumed. Typically, since the meters must be manually read, they only provide the utility with the homeowners total use of electricity for the month. Use of radio waves for real-time transmission of the data to the utility. Two way radio communication so that the utility can send signals to the meter. The ability to turn service on or off remotely. The ability, in the case of the electric smart meter, to act as a gateway for communication by the utility to and from individual appliances within the home – once the home has installed the next generation of appliances that will contain ‘smart chips’. * What matters, as far as invasion of privacy is concerned, is not how often the information is transmitted to the utility, but how fine are the intervals of consumption that are being recorded and stored in the meter’s memory. A so called “radio off” meter may invade your privacy as much as one that transmits multiple times per day – provided the utility has an alternate way to upload the data – possibly to a handheld device the meter reader carries. 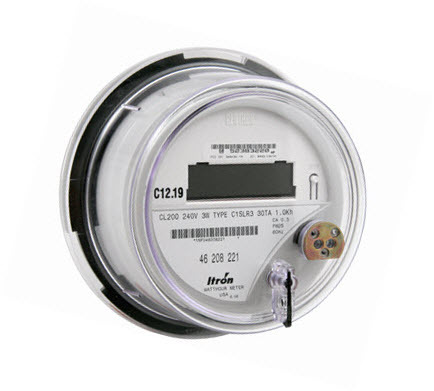 Pictured here is the Centron ‘Open Way’ ‘smart’ electric meter manufactured by Itron, the brand of electric meter now being installed by DTE throughout southeastern Michigan. DTE has mandated that EVERY CUSTOMER receive this exact same meter. This meter contains two radio transmitter/receivers. The first operates at 902 Mhz and, except for ‘opt-out’ customers, both transmits and receives detailed information to or from the utility on a real-time basis. Th second, called a Zigbee radio, operates at 2.4 Ghz, and for ALL customers transmits and receives detailed information from smart appliances in the customer’s home. Customers who sign up for the ‘opt-out’ program and agree to pay both an initial fee and monthly fees, will have the 902 Mhz transmitter turned off. The 902 Mhz receiver still is able to receive commands from the utility to turn off particular appliances or to turn off service altogether through a disconnect switch in the meter. The Zigbee radio is not disabled, so that the meter can still receive signals from and transmit signals or commands to smart appliances within the home. Under the ‘opt-out’ program the meter must be read manually by a meter reader using a handheld device. Data from the smart meter is downloaded to this handheld device through an optical port on the meter face. It is subsequently uploaded to the company’s computers where it may be maintained indefinitely in the company’s database for possible sale to third parties or to provide information to law enforcement about activities within the home. No additional provisions or waivers of fees are being made available to customers who have a documented medical condition. The principles of operation are much the same where gas or water meters are concerned. Again it is the accumulation of granular usage data that defines the smart meter, and that data is usually, though not always transmitted to the utility on a real-time basis. To implement ‘time of use pricing’. This means the customer may be charged more when electricity, gas or water is used during times of peak demand, and less for off-peak usage. The idea is to provide an incentive for customers to shift certain energy or water using activities to times when the total demands on the system are less. In the case of electricity this may mean running the dishwasher, washer or drier during late evening hours. The hope would be that building new generator capacity might be avoided, at least for a time. Similar incentives could be provided people to run their furnaces or hot water heaters at times when demands on the system are less. Or to water their lawns at times when demands are less, with less risk of lowering water pressures. To be alerted in real-time when an electric, gas or water outage happens and to be able to dispatch service personnel to the correct address quickly. To be able to remotely get readings whenever needed, for example at the time of a move out or move in. To be able to turn service on or off remotely because of a move out or because a bill has not been paid.